The Blog Happy 5th Birthday, iHear! On this day in 2011, St Joseph Institute officially began the iHear program with the intent to reach every child, everywhere. This was not a pipe dream but a belief by our Board and staff as an extension of the mission. “Reaching children, providing hope where no other resource existed, was the goal of this program. We knew there were children who needed help but could not locate it within their communities. This was an answer to many, many prayers by parents and providers across the nation and the world,” says Cheryl Broekelmann, Director of St Louis Operations and the head of iHear since its inception. “We believed we could help move children forward with the goal of listening and spoken language and provide outstanding support for their parents. Deafness is a journey and we walk shoulder-to-shoulder with our families. For more than 179 years we’ve worked our mission with joy for children – today is no different than yesterday.” The Sisters of St Joseph of Carondelet, captured with the mission-focused dream of helping those who may be forgotten, provided the first seed money for the idea. Emerson later helped continue the pilot and establish pathways for service. 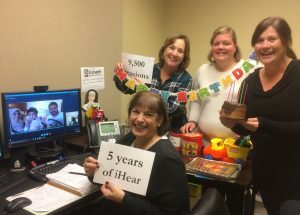 9,500 sessions and five years later, iHear continues to serve children who do not have other options and support their parents who send grateful thanks. From a toddler in Kansas to a school age child in Russia, iHear provides hope in the United States and around the world. Happy birthday, iHear! Thank you to our Board who helped us move forward, our staff who joyfully works the mission and our supporters who believe in the power of our services. A great big thank you to the Sisters of St Joseph who understood the power of change in this delivery method. Because of the combined effort, kids everywhere can get the help they need to become their best selves.